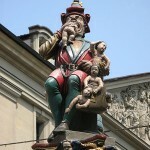 Detail from a fountain in Bern showing a child-eating ogre, a reference to the blood libel. At the heart of medieval anti-Semitism – and still often found in some modern forms of anti-Semitism – was the ‘blood libel’. The blood libel is a baseless but widely accepted conspiracy theory. It alleges that Jews routinely kidnap, torture and sacrifice Christian children. The purposes and details of these supposed murders varied, though in most cases the blood of the victim is put to ritual or ceremonial use. The blood of virginal Christian children, according to medieval conspiracy theorists, was highly valued by Jews. In some anti-Semitic stories, they use this blood to make their matzoh (unleavened bread). In other accounts, Jewish elders were said to drink blood in mockery of the Christian Eucharist (the wine symbolising the blood of Christ). In various renditions of the blood libel, the young victim is bled dry, gutted, flayed, crucified, marked with stigmata (the wounds of Christ) or bedecked with a crown of thorns. Though the origins of the blood libel are not known, it probably dates back to ancient times when Jews were often demonised with accusations of ritual sacrifice. Some chroniclers even accused them of murdering their own children (the Biblical story of Abraham, who was willing to sacrifice his own son Isaac to God, is sometimes offered up as ‘evidence’ of this supposed Jewish practice). In reality, there is no historical or scriptural tradition of human sacrifice in Judaism. Murder is explicitly forbidden in the Torah, while Jewish dietary laws (kashrut) prohibit the consumption of any type of blood. According to kashrut, animal flesh must be ritually slaughtered and drained of all blood (shechita) before it can be butchered and prepared for human consumption. Participants in the First Crusade (late 11th century) may have introduced stories of Jewish sacrifices and ritual murders into Europe. One of the first documented accounts dates back to 1141, when an English boy, William of Norwich, was reportedly kidnapped and murdered by Jews. According to legend, William was tortured and crucified, his forehead lacerated as a mockery of the wounds inflicted on Christ by his crown-of-thorns. William’s kidnappers allegedly drained his body of blood, which they either drank or used to make bread. Though none of this was apparently supported by evidence, and the account was later rejected by the pope, the story of William of Norwich became an oral myth that endured for generations. 1181: Bury St Edmunds, Suffolk. The body of a young boy named Robert was found. According to some reports, he had been ritually murdered on Good Friday. Robert’s death triggered a pogrom against local Jews; more than 50 were killed and the rest were expelled from the area. 1181, rural France. Three boys disappeared after last being spotted on a frozen river. According to testimony from some, the boys were slaughtered by a group of Jews. More than 300 Jews were burned at the stake. The bodies of the three boys were recovered in the spring; they had been drowned, not ritually murdered. 1250: Zaragosa, north-eastern Spain. The disappearance of a young choirboy, Dominguito de Val, was immediately blamed on the local Jewish community. According to legend, Dominguito was sacrificed because he sang Christian hymns on the streets, an act that infuriated Jewish hawkers. A coven of Jews reportedly murdered Dominguito and threw his heart into the town’s river. Sixteen Jews were hanged and others were persecuted, despite there being no evidence of Dominguito’s body or of his fate. 1255: Lincoln, northern England. The body of a nine-year-old boy named Hugh was found at the bottom of a well. A local Jew was arrested and confessed to his murder, probably under torture. The ‘crime’ provided the English king, Henry III, with a pretext for arresting wealthy Jews and seizing their property. Several dozen Jews were detained in the Tower of London; 18 were hanged for refusing to participate in an investigation into ritual murders. ‘Little Hugh of Lincoln’ was rushed into sainthood, though this was never formally endorsed by the Catholic Church. 1287: Oberwesel, western Germany. The body of a teenaged boy named Werner was discovered floating in the Rhine. His death was ascribed to Jews, who suffered years of violence and persecution, despite repeated pleas for calm by local rulers. 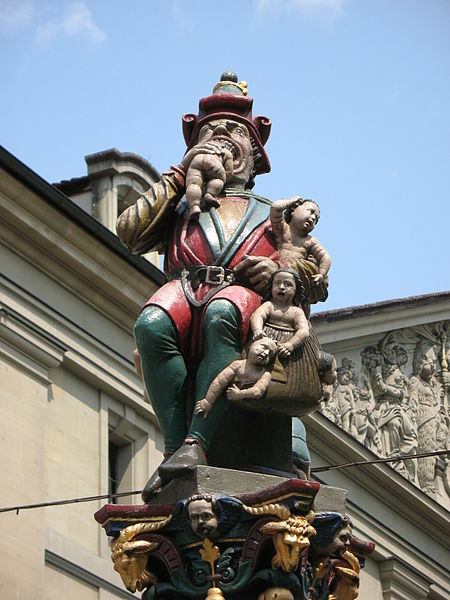 Seven years later, Jews in Bern were also blamed for the death of a young child named Rudolph. 1475: Trento, Italy. A two-year-old boy named Simeon vanished at a time when anti-Jewish sentiment was at its peak. Local Jews were immediately blamed for Simon’s disappearance. Jewish leaders were arrested, detained and tortured; some of them confessed under torture. Fifteen Jews were executed, while Simeon – like other ‘victims’ of alleged ritual murders – was rushed into sainthood. 1529: Bazin, Hungary. The disappearance of a nine-year-old boy triggered anti-Jewish riots. Thirty Jews are rounded up and burned at the stake, after confessing under torture to the boy’s murder. The boy was later found alive and well; he had been kidnapped by a local man who owed large sums to Jewish money-lenders. By the 14th century, the blood libel was accepted as fact across much of Europe. Whenever a child went missing or was found murdered, the first shadow of suspicion fell on nearby populations of Jews. Blood libels triggered dozens of pogroms and anti-Jewish campaigns across Europe, most notably in Spain, France, the German states and Russia. At various times the blood libel was rejected by the Catholic Church; at other times it was actively supported by the pope, members of the higher clergy or agents of the church, such as the Spanish Inquisition. Though there were fewer instances of the blood libel during the Reformation and early modern periods, at least eight different accounts were recorded during the 1800s (see 19th century anti-Semitism). 1. The blood libel is a long-surviving myth that suggests Jews abduct and murder Christian children. 2. According to this myth, they do this to use Christian blood, either as food or for ritual purposes. 3. Though this myth is unsupported by evidence, it was widely accepted as fact during the Middle Ages. 4. Numerous instances of missing or murdered children were blamed on Jews, who were targeted in response. 5. The blood libel survived into the 19th and even the 20th centuries, particularly in Russia and eastern Europe.